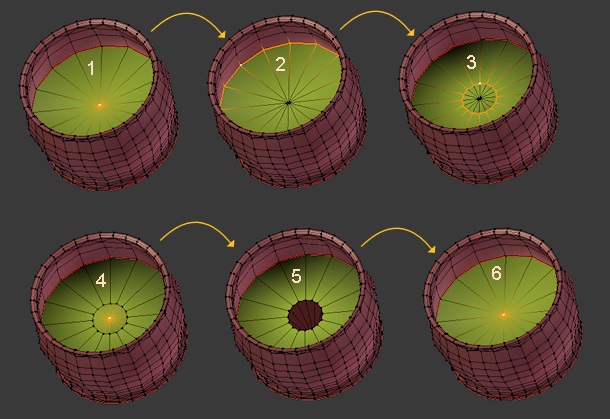 Sometimes you may want to build your Sculpties from arbitrary blender objects or by using special techniques which create entire meshes (like Spin or screw for example) or by simply extruding. But when you use these building techniques, then you still need to create the Sculpt-Map. 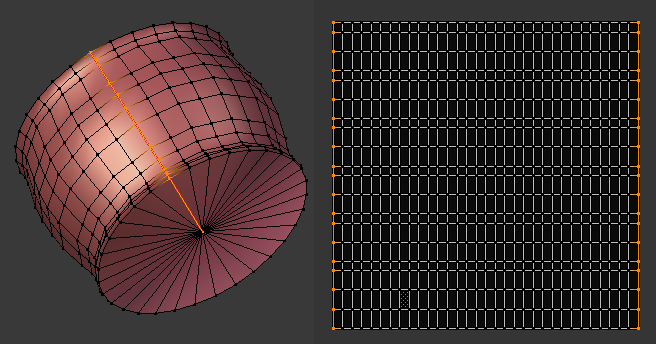 As long as the mesh object can be unwrapped to a Sculptie compatible UV-map, the “sculptify” script is your friend. 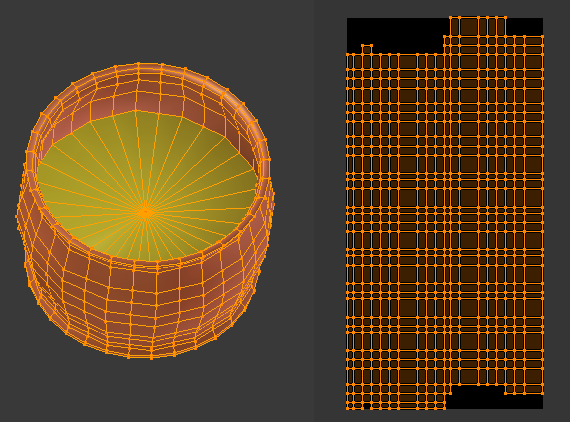 This function takes your object, analyzes its mesh and creates the UV-map. The mesh must be unwrapable to a single flat and rectangular surface with no holes or cuts in it. Sculptify only works correctly if the mesh has got a mesh topology which is exactly conform to the constraints of Sculpted Prims as defined above. So when you sculptify a sculptie, then Sculptify will almost ever work properly. But be aware: Especially tortured Sculpties as they are made for fractional sculpting do normally not work very well with Sculptify. This is an example where Sculptify will get a lot of trouble. 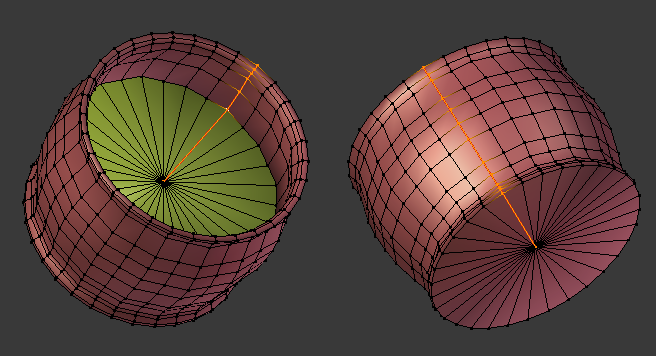 The object consists of several submeshes (2 here). And it contains a bunch of triangles (around the edges). While Sculptify will try its best to get submeshes merged into one Sculpted prim, it will completely fail on the Triangles. Indeed it will even complain before trying. 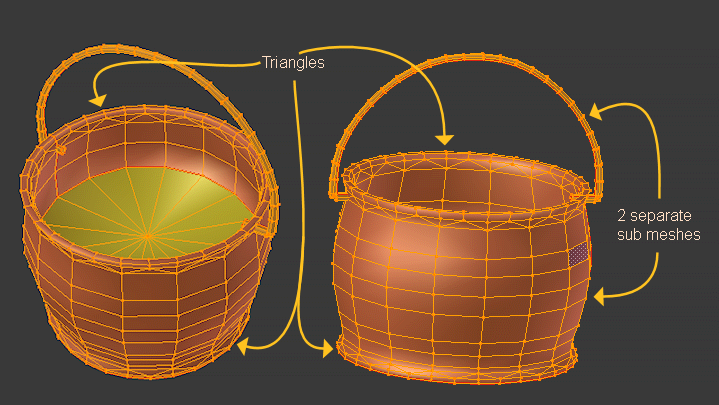 You will end up with a popup telling you, that triangles are not supported in Sculpted Prims. So we have to prepare this object. Although it is possible to convert this object into a single Sculpted Prim, we will make it simple and separate the submeshes first into 2 separate objects (select one submesh in edit mode and then press “p” and choose “selection”). Lets us turn to the kettle and now. This is one single vertex. We want to replace it by a pole (made of 16 collapsed vertices). Scale the new edge lop down a bit so that you can see the new Quads we have just created by extruding. Select the middle vertex and delete it. and collapse it by scaling it to 0 (zero). 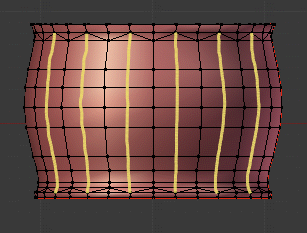 Now we have replaced the single vertex by a pole made of 16 collapsed vertices. Note that each adjacent polygon still looks like a triangle, but now it is really a Quad with 1 collapsed edge! We have to do exactly the same operation also on the bottom of the kettle where we will find another single vertex which needs to be replaced by a pole. If your object was originally a Sculptie, then keep the seams as they are. 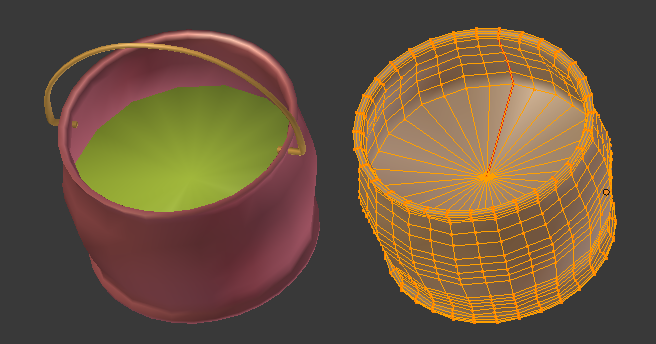 If your object was NOT a sculptie (as our kettle was definitively not a Sculpted prim), then remove all seams from the object now! This is not good. The UV-map looks a bit broken. But at least it is almost rectangular. What happens here ? Well, indeed the Sculptify tool has tried to make a special UV-unwrap (follow active Quad) But the tool did not exactly align the start points of all columns of faces. And also the entire map seems to be rotated by 90 degrees. You can see that when you select one horizontal row on the UV-map and see that it matches to one vertical row on the mesh. This looks very promising. Also the rotation of the UV map has disappeared! The UV-map still does not look 100 percent uniform, but this is indeed not necessary. The Sculptie baker can handle this! Now as an exercise it is your turn to sculptify the handle. We already have seen in the previous chapter, that this function is not only useful to create the UV-map for non sculptie objects, but it can also be used to update the UV-map after adding some edge loops. 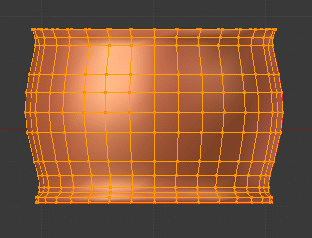 But there is yet another usage scenario: Assume you have modified the mesh in a way which affects the UV-map itself. This often happen when you add or remove an edge lop near the poles. Then your UV map seems to contain some triangles where it should only contain quads. Or even more apparent, when you have added or removed edge loops the ratio of faces along U and V might have changed. In such case you can call the sculptify function and get an updated/fixed UV-map. Hint for Primstar-1 users: You had to remove the “sculptie” map prior to re-sculptify a sculptie. This is no longer necessary. In Primstar-2 sculptify will create a sculptie UV-map if there is none, or it will update an existing sculptie UV-map if it finds one for the selected object.